One pan recipes are fast, simple and so convenient! 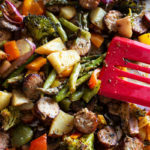 This One Pan Smoked Sausage and Vegetables recipe is made with fresh vegetables and sausage in a sheet pan with a lemon herb marinade. 10 minute prep time! Do you know what I’m doing this very moment? I’m in a car driving (Ok, I’m riding…not driving) from Phoenix, AZ to Universal Studios in CA. My daughter is dancing at Universal Studios this weekend and we are so excited! But I’m JUST as excited that I’ve had full internet and a full battery for 95% of this trip! Thank you Mr. Mason for buying the best technology trinkets! You know what this means? 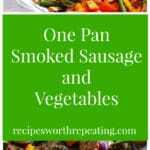 This means I get to share with you my latest creation, One Pan Smoked Sausage and Vegetables! In case you’re wondering…Mr. Mason bought me this Macbook Pro car charger and this Portable Charger. Technology…man, this is the LIFE! So this One Pan Smoked Sausage and Vegetables. Ya’ll…ok delish! Convenient! Meal Prep! Freezer Meal! Fast Prep! Gluten Free! One Pan Dinner!! Do I need to say more? Probably not, but I will! What do all those ingredients have in common? FRESH, HEALTHY, full of nutrition and vitamins….oh and fiber! So much fiber! Ok…now let me introduce you to this marinade. Here’s what we are going to do first. 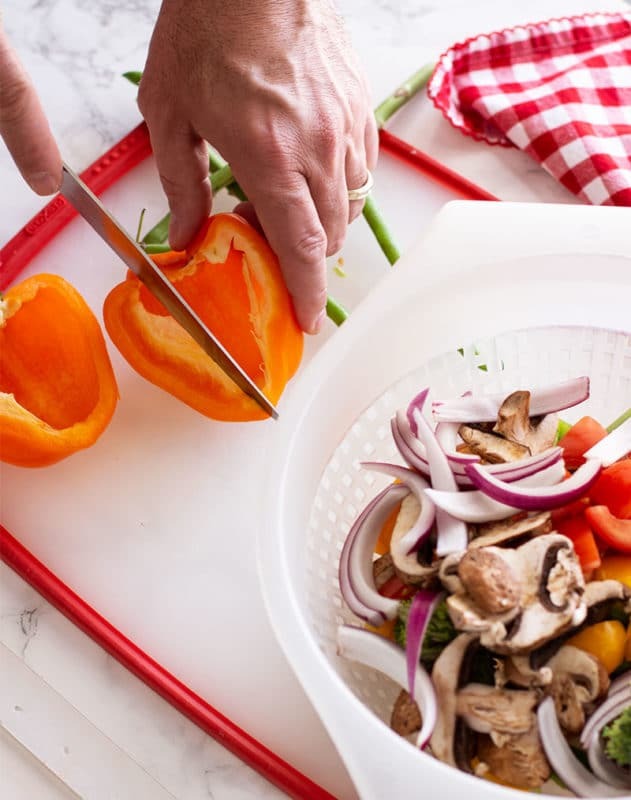 We’re going to chop all those fresh veggies into bite-size pieces and toss them in a colander. After all your fresh veggies are cut, rinse them well. Look at all that color! That’s NUTRITION right there! Can you handle all this freshness? This is going to be a powerhouse of a healthy dish! Get ready! Next, you’re going to cut the sausage into coin shaped bite-sized pieces. Stay with me here because I’m going to talk about the different types of sausages you can use in this recipe below. TONS of options! From there, whip up that marinade I talked about earlier and throw all the veggies, sausage and marinade into a gallon size Ziplock baggie. Seal it tight. Let is marinate in the refrigerator for at least 15 minutes. After the smoked sausage and veggies are finished marinating, line a cookie sheet or metal pan with aluminum foil (or use as silipat) and spread evenly. 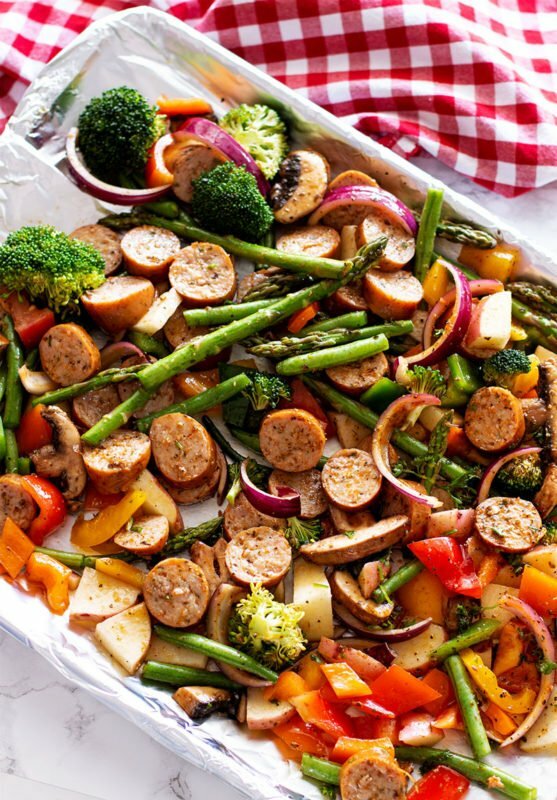 Now, it’s time to pop this One Pan Smoked Sausage and Vegetables into the oven to cook. Looks delish, huh? Is your mouth watering yet? 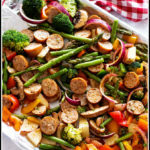 Let the sausage and veggies bake in the oven for 30 minutes, stirring once about 15 minutes into the cooking time. After 30 minutes, you’re done and ready to eat! 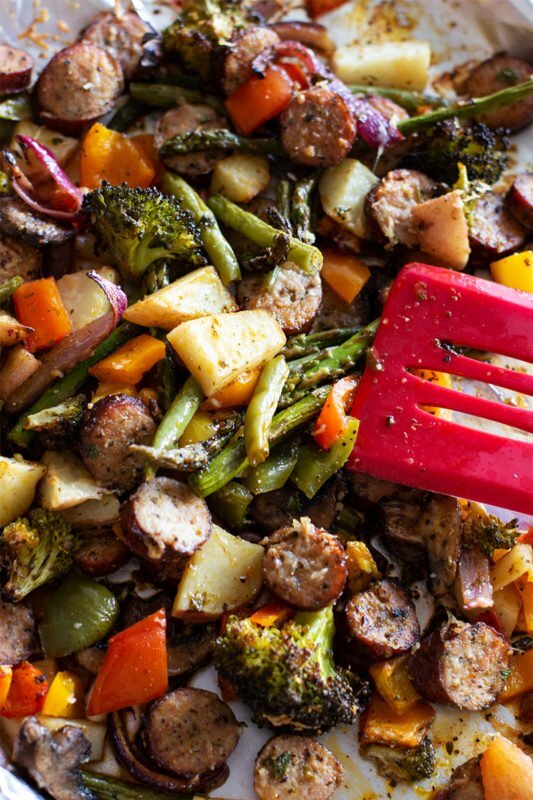 Let’s talk about the different ways to eat this One Pan Smoked Sausage and Vegetables meal. On my low carb days, I eat it straight out of the pan…well, not really. I do grab a bowl or a plate (ok, sometimes). 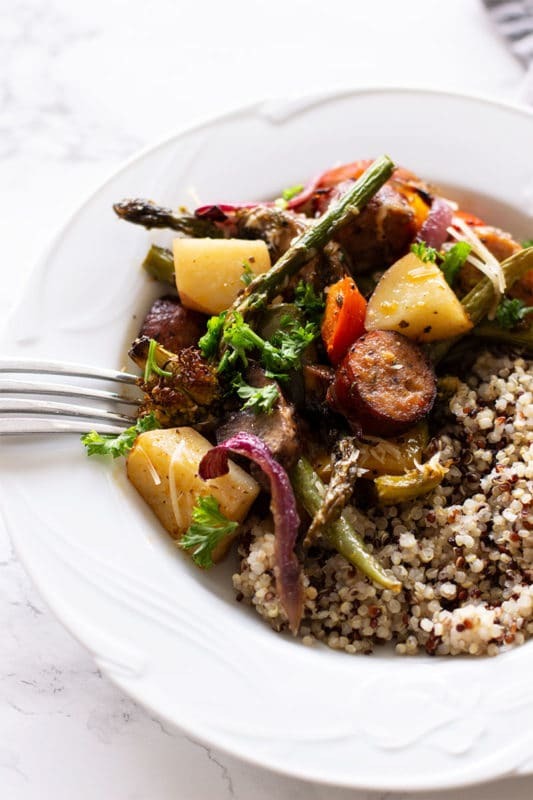 On my busy days where I need a little more energy, I eat my One Pan Smoked Sausage and Vegetables with either rice or quinoa. I make 2 really different yummy rice recipes that you MUST try pairing with this dish. My Ono Rice is a traditional family recipe you don’t want to miss! But if you’re kinda in a hurry…you can make my Instant Pot Rice recipe. SOMETIMES…I feel like mashed potatoes with this dish. Quinoa is also super delish. You choose! Vegetables – Picky about your vegetables? No problem! Use your favorite vegetables in this recipe. 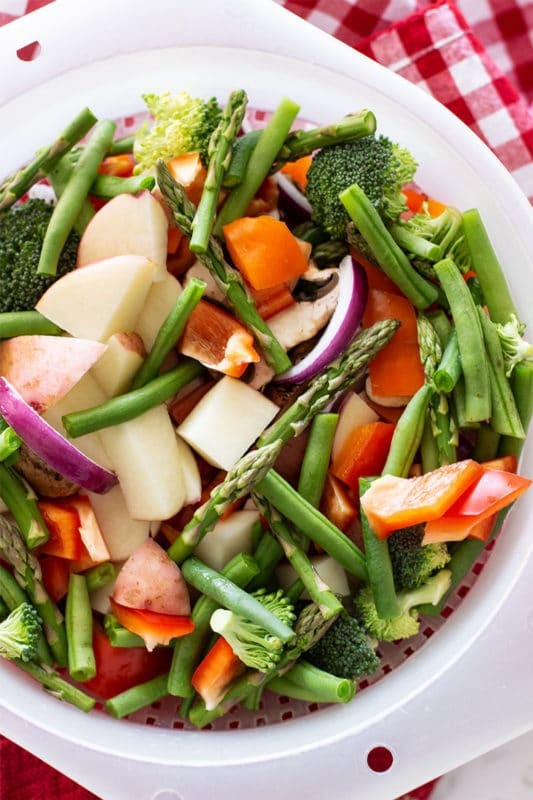 Use SEASONAL vegetables in this dish! It’s AMAZING with eggplant! Oh, and leave the peeling on the potatoes. That’s where all the nutrients are! Marinade – I recommend letting the fresh vegetables and sausage marinade overnight, but if you don’t have that kind of time, try letting it marinate for 1 hour. If that’s not doable, 15 minutes will do. Just remember…the longer the marinade process, the more flavorful your dish will be! Sausage – This is where it gets fun. There are SO many types of sausage you can use!! Typically, I use Hillshire Farm Chicken Smoked Sausage Roasted Garlic flavor. And no, this isn’t a sponsored post. I just REALLY like their sausage! It’s lower in fat. And it’s chicken. However, there are days when I want more fat in my diet, so I’ll use a pork sausage on those days. 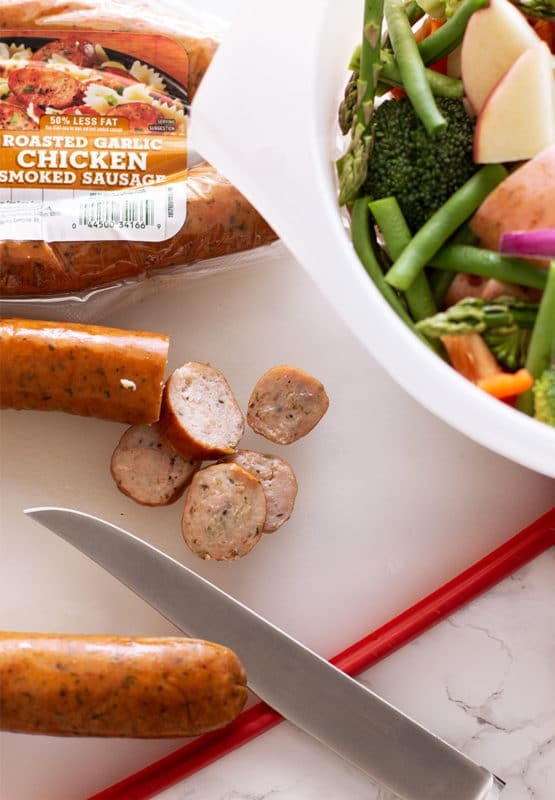 I really like Johnsonville New Orlean’s Style Smoked Sausage. It adds a bit of spice to my day! You get what I’m sayin though…lots of options here for you! Freezer Meal – Sometimes I like to double this recipe so I can freeze a batch. Note that I always make my marinade fresh…I just freeze my veggies and sausage. When you’re ready to pull this out of the freezer, let it sit out for an hour to thaw and then whip up your marinade. From there, throw the marinade in the Ziplock baggie and throw it in the refrigerator and let it marinate. 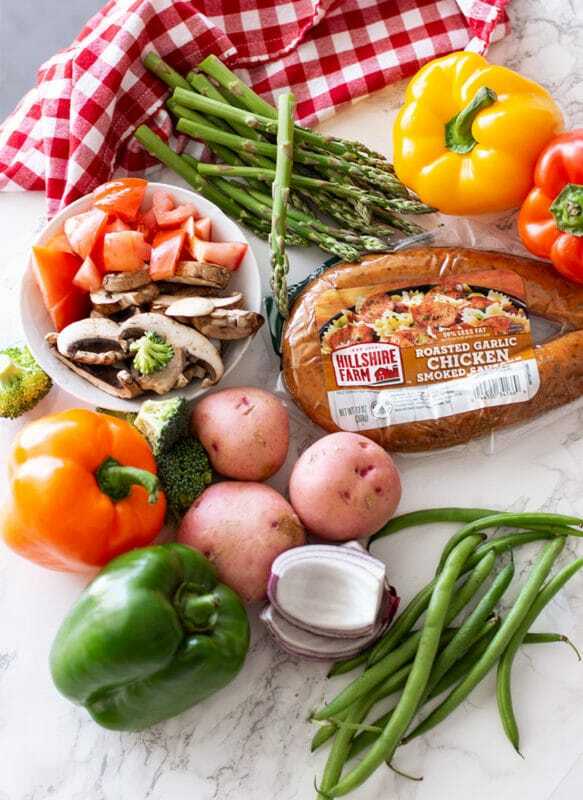 Meal Prep – This is the PERFECT recipe for meal prep! This makes the best lunch and it’s so good the next day! 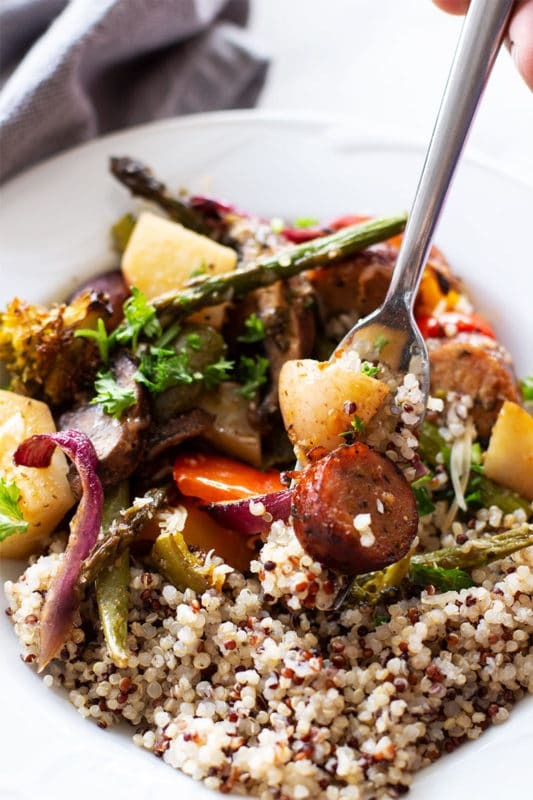 Add in your rice/quinoa, veggies and sausage and you have a perfectly balanced meal! There you have it! So delish…did I say that yet?! Enjoy this gluten free yumminess! Now I’m off to enjoy watching my daughter dance at Universal Studios! So tell me…did you make this recipe? If so take a picture of it and tag me on social media! And also, please give it a star rating below! Make sure to FOLLOW ME on Facebook, Twitter, Instagram and Pinterest because ya’ll… I’m CONSTANTLY posting yummy food that I know you will love! Don’t miss out on the yumminess! 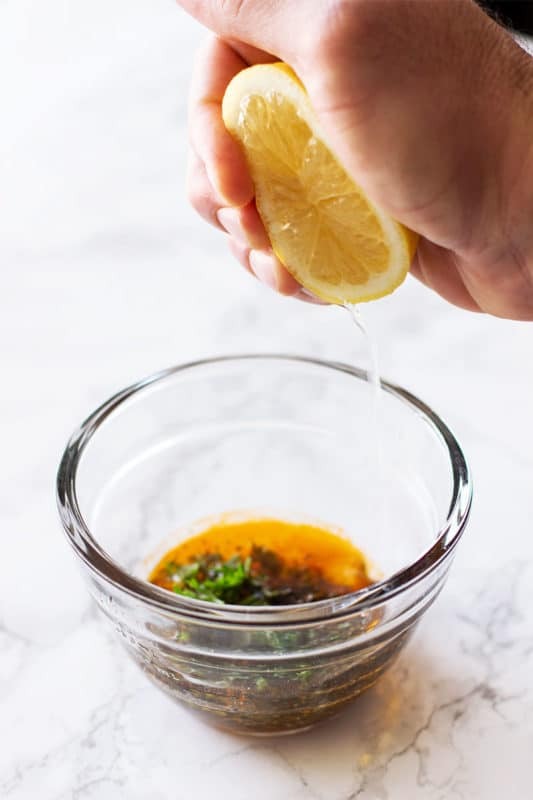 Combine all marinade ingredients and mix together in a small bowl. Set aside. Chop all vegetables into bite size pieces and rinse well. Cut smoked sausage into coin shaped bite-size pieces. 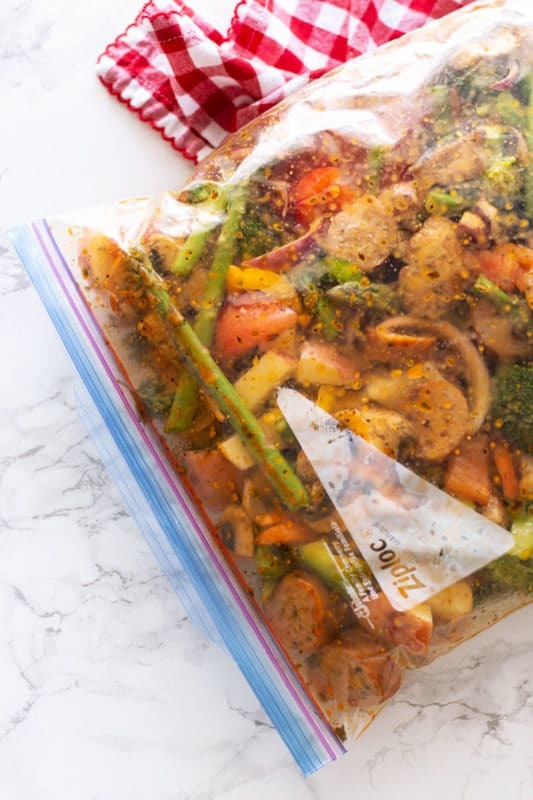 Toss sausage, chopped vegetables and marinade into a gallon sized Ziplock bag and seal. Shake the Ziplock bag to ensure all ingredients are well covered. Place the Ziplock bag in refrigerator and let marinate for at least 15 minutes, up to 24 hours. Line a large cookie sheet or pan with aluminum foil (or use a flexipan). When the ingredients are done marinating, pour the contents from the Ziplock bag onto the pan. Spread evenly. Serve with quinoa, rice, mashed potatoes. Top this recipe off with fresh grated Parmesan cheese. This dish looks amazing! I think it will be perfect for the summer) Love making simple and delicious one pan recipes! It is perfect for summer, for sure!! Everything on one pan? And it’s healthy?! Sign me up! Yep – super convenient! I hope you enjoy! I love the flavors of this one pan dinner! Thanks so much for sharing with us at Full Plate Thursday and sure hope you are having a great week! I’m so glad you like it!! Enjoy!! Very tasty but the quantities seem quite off. There is about 6 lbs of food in this recipe. Even after reducing the quantities of some items, only about 2/3 would fit into a gallon ziplock. The marinated bag contents are enough for 2 pretty well loaded pans, and there was enough left over that didn’t fit into the bag for a tasty stir fry that fed 3. The bag was too big to shake/mix, so I poured it all into a large bowl from a salad spinner to mix it all up before returning it to the bag for marinating overnight. I also doubled the marinade when I realized how much food there was to coat. Aside from the fact that there was enough to feed a small army, I thought it was quite good. Hi Keith! Too funny! I’m glad no one went hungry! I’ll go in and reduce the amounts of some of the vegetables. Glad it was tasty though! I actually love this recipe WITHOUT the sauce! Just something to try at some point!